2XU's compression range has been completely re-engineered for the 2019 season to offer you the most advanced technology in fabric design ensuring comfort and performance. 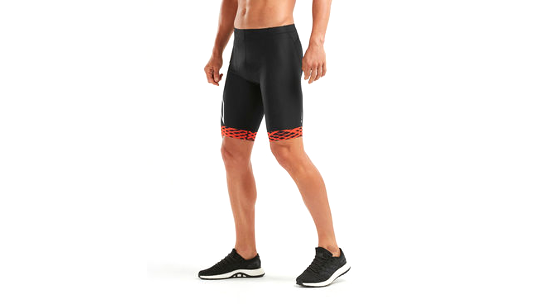 The men's triathlon short is great for wearing as part of a two-piece as a racing option or for using on the bike or turbo as well as running when training. Power mesh fabric, designed in partnership with Melbourne University Institute of Technology (RMIT), stabilises muscles in the upper leg which not only reduces fatigue during your training/racing but also helps you to recover quicker afterwards. Two pockets, placed at the back of the shorts, are the perfect place for storing your favourite race nutrition. The shape of the pocket is designed to fit gels, shot blocks or even energy shots. Finally, the Pro LD Chamois is made to absorb as little water as possible and also has soft edges to help improve comfort and keep the chamois discrete on the run. New for 2019 - The latest 105D Power Mesh fabric technology offers incredible stabilization for greater power output and less vibration for reduced muscle fatigue. The powerful fabric mesh construction boasts increased ventilation for heightened body cooling, as well as aerodynamic, dimpled airflow technology for greater speed and the ultimate moisture management.